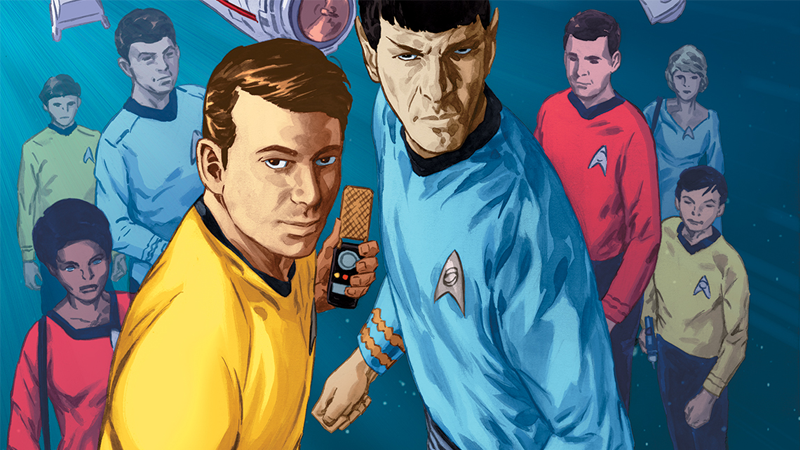 IDW’s ongoing Star Trek comic has been following J.J. Abrams’ version of Captain Kirk and friends for a five-year mission of its own. But to celebrate the franchise’s 50th anniversary, a brand new series will not only finally return to Trek’s original universe, but chronicle new adventures from all of its various eras. Star Trek: Waypoint will be a bi-monthly anthology series that brings together a team of rotating artists and writers to tell new short stories across the vast Star Trek pantheon. The first issue begins with tales set in the Next Generation and during the original series, with Data and Geordi LaForge on the hunt for a shocking scientific discovery in a story by Donny Cates and Mack Chater, followed by lieutenant Uhura stranded and struggling to survive on an uninhabited planet courtesy of writer/artist Sandra Lanz. We spoke to the first two writers of the series, Cates and Lanz, to discover what’s in store for the heroes of Star Trek’s original setting (along with exclusive uncolored artwork from Lanz, making its debut here on io9). A blockbuster bi-monthly anthology to celebrate 50 years of STAR TREK, featuring short stories across all Treks, by the top talent of today and yesterday! First, a NEXT GENERATION story by Donny Cates and Mack Chater. Unable to decipher a mysterious ship’s coded messages, Starfleet has enlisted its two greatest scientific minds, Captain Geordi La Forge and his best friend Data, to investigate. What they discover will alter the course of scientific human history as we know it! Then, an ORIGINAL SERIES story by Sandra Lanz, where a crewmember, stranded on a strange planet, encounters a bizarre alien creature. They must learn how to interact, but how? io9: Donny, Sandra—How did you get involved with Waypoint? Donny Cates: I think it all stemmed from [IDW’s Star Trek Editor] Sarah Gaydos and I wanting to work on SOMETHING together. We’ve always gotten along very well, and we’d almost worked together on a few things in the past and for whatever reason (and through no one’s fault) they just kept slipping through the cracks. I believe, weirdly enough, that Sarah saw me tweeting about Star Trek and my love for it, and sent me a DM asking if I’d want to come and possibly do something with the title. I didn’t know if I could even hang in that arena, and honestly, it took me a bit to come back and finally say yes. Trek, to me, isn’t something that you take on lightly, and I wanted to make sure I had a story that honored the source material and the ethics of the series. Once I nailed down my idea for the story and shot it past Sarah, it quickly spiraled from just another fun story to being the lead story in the first issue of Waypoint. I still have a hard time believing that’s true. The words “It’s an honor” aren’t nearly big enough. Sandra Lanz: I was recommended by fellow sci-fi comic creator, Malachi Ward. He’s part of a group of creators who I’ve bonded with over our love of Star Trek and the ways it influences our personal work. Donny, is Geordi and Data’s friendship secretly the best pairing across Star Trek? What drew you to focusing on this duo for this story? Cates: Well, this is purely subjective… but in this man’s opinion, Geordi and Data are the stone cold coolest two dudes in the galaxy. When I thought about this story I asked myself “If this is the first and last Trek story you ever write, what would it be?” and the answer was obviously Geordi and Data being awesome science bros solving space-science mysteries with ethics and math together across the universe. It doesn’t get much better than that. To me at least. What’s it been like working with Mack Chater on the story? Cates: Again, this was an absolute best case scenario for me. I had wanted to work with Mack for a very long time and we were just never able to line it up. When Sarah asked me who I wanted to cast on art for the book, he was my top, and only, choice. Mack is a great guy and just a wickedly talented artist. Everyone is going to flip out when they see this book. You can tell just by looking at his work that he’s way, way into Trek. We all are. I’ve been so incredibly spoiled by this entire creative process. It’s been a blast, and I really hope everyone digs what we put together for them. Sandra, the brief solicit for your story brings to mind an Original Series-style take on the classic TNG episode “Darmok.” Was that something at the back of your mind while writing it, or did you want to go into it without that frame of reference? Lanz: “Darmok” is one of those episodes that really stuck with me after I first saw it; it was definitely in my thoughts when I came up with my story for Waypoint. It made me think a lot about the origins of speech, evolution, and the process of learning to speak, which are the ideas I built my short around. As an artist as well as a writer, can you tell us about some of the challenges of trying to recreate the retro-futurist aesthetic of the original Star Trek while keeping the art looking like a modern comic? To me, one of the charms of the Original Series is the naiveté that went into the quintessentially-sixties set design. The worlds they visit on the show are often times simple, idyllic, earth-like... So I tried to capture that spirit when designing the setting for my story, and afterwards, punched up the vibrant Technicolor scheme to balance out my modern, digital drawing style. It was REALLY fun. What do you consider to be the core of Star Trek? What’s the ‘trekkiness,’ for lack of a better term, that you’ve tried to instill in your stories? Cates: I think at the core of the series, and the thing that echoes throughout every incarnation of the show and movies and comics and what have you, is the idea of a future full of hope. Beyond the shiny starships and cool aliens and all of that is this idea that, if we can only get over our flawed human nature and our petty differences, if we can stop hating and fighting each other over lines in the dirt or imagined differences between us as people….if we can do that…we can have the stars. Lanz: Star Trek is so much about being human. So many of its themes boil down to really essential questions about who we are, the place we hold in the universe, and what our responsibilities are as one species amongst many. They’re timeless questions, and they’re as relevant now, as they were 50 years ago! Cates: I think that trait makes Star Trek unique. Because it’s not just a fandom or cool show or a clever set of ideas…it’s a representation of a goal that is very much worth fighting for. Because, hey…. if we can all be nice we get to have holodecks, you guys. Star Trek Waypoint #1 hits shelves this September.